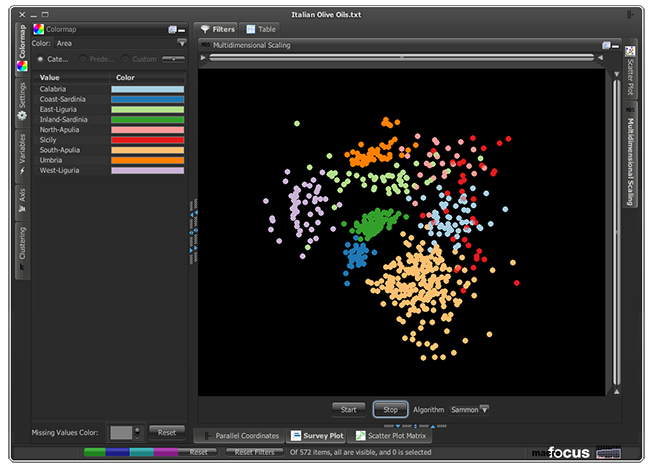 The Multidimensional Scaling view allows you to create a two-dimensional projection of the multidimensional data that attempts to capture the main relationships: items close together in the view are similar in the high-dimensional space while dissimilar one will be further away. The process is iterative can be started using the Start button. When the layout has reached the desired stability, hitting the Stop button will terminate the computation. Two layout algorithms, Spring and Sammon are currently provided.